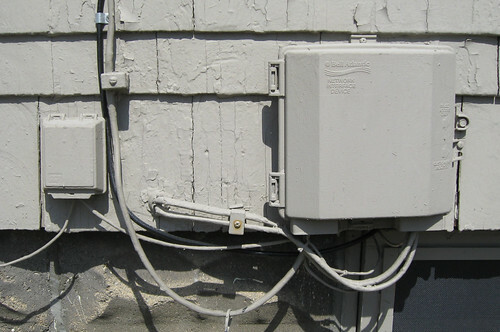 One of the difficult parts of the digital divide, the part that few have been able to begin to posit solutions for, is home delivery of fast internet connectivity to neighborhoods where the income level is low. Most of the big network providers push their high bandwidth solutions to upper-middle and upper income neighborhoods, so they can finance the high cost of building fast data networks, and poorer neighborhoods are left to whatever facilities are available, often meaning that some neighborhoods get much less bang for their buck. DC-CAN, the DC Community Access Network, is looking to bridge some of that divide by providing “middle mile” service to other ISPs for reasonable costs, allowing them to serve high speed needs cheaply in neighborhoods where that service just isn’t available. The first of those links to neighborhoods east of the river went live yesterday, (as an aside, this story at GigaOm misses much of the point of this kind of network, which is sorta sad) adding in a 100-Gigabit core link, the first of a series of core links th;at will spread throughout the city eventually, but beginning in Ward 8. How fast is 100-Gigabit? Well, consider that the fastest common home broadband package in DC is 50 megabit, and costs around $100/mo, you could power 2,000 of those connections with just one of these core links. Consider that most of these connections are really just burstable limits, and you could safely oversubscribe them, or limit service to 20 megabit, and you get a picture for just how many options you’ve got and what this will mean for ISPs. What will mean for consumers East of the River? It’s not very clear, yet. This doesn’t solve a pair of problems, and the solutions to those problems aren’t even close to clear yet: this isn’t last mile coverage, you still need to find someone to connect the actual houses and create the actual service, including run billing systems and do installation, and that’s not something that just happens overnight; and how do we make good computers cheap enough, but useful enough, to make these more common fixtures in homes all over the city that currently lack any connectivity or method for getting connected. “This is more smoke and mirrors,” said Nikki Peele of Congress Heights on the Rise, when I talked with her by phone this morning. “I’d much rather have seen this money spent on a slower WiFi network that blankets the area than something that’s just going to benefit outside ISPs,” she continued. This is a great looking network, for sure, but what it will mean for actual citizens of the District is a long ways in the future, and definitely far from clear. We had hoped to have some word from DC-CAN, but no response was available at the publish time of this article.